1. A mania for writing poetry. 2. A mania for writing poetic verses. A mental condition consisting of delusions of being rejected and repulsed by everyone: Since Mark was psychologically possessed by misomania, he hated everyone and everything. 1. In psychiatry, a person who is suffering with the mental delusion of persecution and hatred: Jake decided to see a doctor because he had a feeling that his supervisor despised him and wanted to control his work more than his colleagues’, although his co-workers tried to convince him of the opposite; so, he thought he must have the symptoms of a misomaniac! 2. Someone who hates everyone and everything: As a child, Jeremy grew up in a difficult family situation and felt that his parents were always against him, no matter what he did; so, he had a real grudge and bitterness towards them and, as a result, his psychologist said he probably has become a misomaniac. 1. A form of insanity shown in a patient's obsessive preoccupation with only one idea or one topic: After the nightmare, June suffered from monomania in which she was totally irrational and afraid of losing her baby. 2. 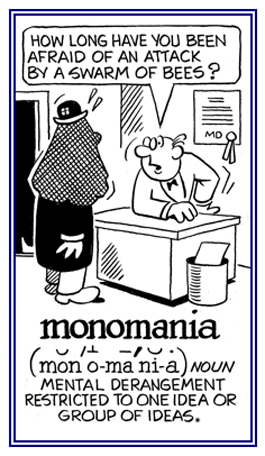 A psychosis marked by the limitation of mental action in a particular topic, as the delusion in paranoia: Because Susan was constantly afraid of losing her job and not able to think or act on anything else, she went to the doctor who diagnosed her as suffering from monomania. © ALL rights are reserved. 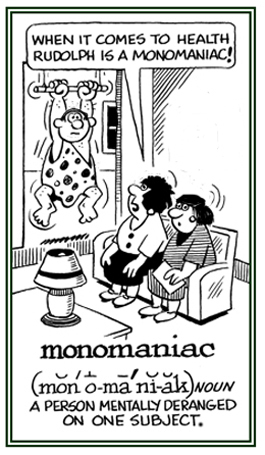 A reference to a patient who has a form of insanity in which he or she is irrational regarding only one subject or a single idea: Being a monomaniac, Fred spent all his money on everything concerned with fitness and spent all of his time training at the gym! © ALL rights are reserved. A reference to or a descriptive term for someone who has an intense concentration on or exaggerated enthusiasm for a single subject or idea. Descriptive of being obsessed with or fixated with one idea or object; either negatively or positively: "She behaves monomaniacally whenever she is told that she will have to leave her apartment; especially, when there is any hint that she will have to move to a nursing home." An excessive fondness for or an insane love of music. An unusual or abnormal fondness for or interest in mice. 1. 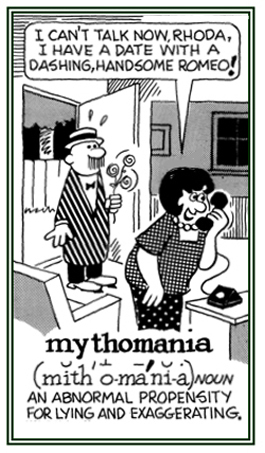 An excessive interest in myths and incredible stories and fabrications: Alice, who had an enormous curiosity about fables and legends and spent all her time reading them, was seen by her family as experiencing a bout of mythomania! 2. A pathological lying or exaggerating about something that isn't true: The actress didn't have many friends because of a case of mythomania, always making up fantastic stories which all turned out to be false tales! © ALL rights are reserved. One who has an abnormal or pathological tendency to lie or to exaggerate. 1. A morbid desire to gain relief from painful stimuli; usually, through some pharmacological agent; such as, morphine, opium, etc. ), but also occasionally through psychic measures involving hypnosis. 2. An uncontrollable craving for narcotic drugs. Showing page 17 out of 27 pages of 403 main-word entries or main-word-entry groups.